The David Owsley Museum of Art at Ball State University in Muncie, Indiana was established in 1935. Its permanent collection includes over 11,000 objects spanning Western art history. The David Owsley Museum of Art at Ball State University in Muncie, IN was founded in 1935, but its roots began much earlier with the formation of the Art Students' League in 1892. After hosting successful art exhibitions, the group then formed the Muncie Art Association in 1905, which purchased one work of art each year to begin building the future museum's permanent collection. By 1918, the permanent collection was displayed at the Indiana State Normal School, which was to become Ball State University. The University's Fine Arts Building opened in 1935, which housed the collection. In 1991, the gallery's official name became the Ball State University Museum of Art. The Museum opened in September 2002 after an $8.5 million renovation. In 2011, the Museum was renamed to the David Owsley Museum of Art to honor the donor who helped make the 2012-13 renovation possible. The David Owsley Museum of Art cultivates lifelong learning and recreation in the visual arts through its collection of original works of art, engaging exhibitions, and educational programs for the university community and other diverse audiences. Fine Arts Building, Ball State University in Muncie, Indiana. The David Owsley Museum of Art at Ball State University maintains a large permanent collection, so it requires art conservators to help conserve works of art that may become damaged by use or with age. To learn more about the highly specialized field of art conservation, read interviews with art conservators. The David Owsley Museum of Art at Ball State University in Muncie, IN's art collection includes "ancient, medieval, Renaissance, 17th century, 18th century, 19th century, modern, Asian, and arts of Africa, Oceania, and the Americas." 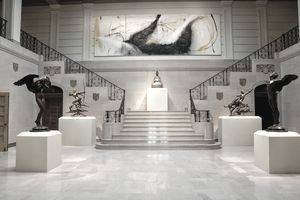 "The museum also houses European and American decorative arts and furniture as well as works on paper, including drawings, prints, and photographs. Another part of the collection features the Hoosier Group of Indiana painters." The Museum's collection includes artworks by artists such as Hans Holbein the Younger, Jean-Baptiste-Siméon Chardin, Thomas Cole, Jean-Francois Millet, Anthony Caro, Grace Hartigan, and Henry Moore. An internship program for university students provides hands-on museum experience for budding arts professionals. The David Owsley Museum of Art at Ball State University in Muncie, IN posts employment opportunities on BSU's website. Positions may become available in the various departments such as administrative, educational, conservation, curatorial, marketing, sales, grounds and security, and visitor services. The David Owsley Museum of Art at Ball State University posts jobs on the University's website when positions become available. Please refer to the website for specific instructions on how to apply for a position. David Owsley Museum of Art, 2021 W. Riverside Ave., Fine Arts Building, Ball State University, Muncie, IN 47306. Tel: 765-285-5242.